We Have A Variety Of Christmas Crafts For You To Make And Enjoy. You can make Christmas crafts all year long. I think how you decorate any tree is to think about what you enjoy in life, or if you want to make a statement or impact. You can go from crystal objects to stuffed animals, kitchen utensils to jewelry or old fashioned to high tech. Ive always been of the belief if you can think it, or dream it, you can do it! Christmas is a time for caring, sharing and memories. It doesnt really matter how much money you have; its the memories you have. 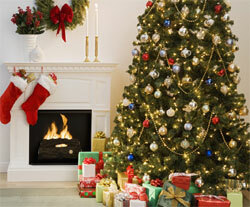 This year, why not choose a special theme for your holiday tree and make a memory for your family and friends! Take a walk in the park, look in the garden shed or pull your childs artwork off of the refrigerator-all are resources for decorating your holiday tree. A short walk in local parks can yield seedpods and pinecones as inexpensive decorations; just paint, or leave natural and add ribbons to hang on the tree. You can reduce color copies of your childs artwork and create art miniatures tied with ribbon for your tree. Your childs favorite stuffed animals can climb the branches of the tree, or stand guard among the packages. Youre only limited by your imagination. Just sit back and imagine your tree with all of your homemade ornaments. Look around your house at the things you have made for Christmas to decorate your home with. I have listed a few free Christmas projects below to help you make beautiful ornaments, wreaths, tips and even kids projects. Check back often because I will be adding more all the time. If you have any questions or Christmas Crafts idea please contact me and I will add it to my site. Make those special gift tags using recycled card backs, paper or foil. You can decorate them with dimensional paint (which is very easy to use), glued-on shells, beads or ribbon scraps. Here is a great way to use up all of the wrapping paper after Christmas or birthday parties. All you need to do is run it through a paper shredder and then you can use it for colorful gift baskets. When I spray paint small items like Christmas balls I place them on a covered lazy susan. That way you can spin with one hand while you spray with the other. You don't get the paint all over your hands doing it this way. You can save money on your holiday decorating. Instead of buying fresh swags and wreaths to decorate your home why not make your own! Just pick up a small ugly tree at a very low cost and cut it up and make your own sways for a lot less money. This is a neat idea that Mary Jane has. She wraps her front door in a bright red paper and then hangs a huge gold bow on it. It is a great welcome when her guests come.